Are you looking for plastic cards whose designs meet your wishes? Or would you rather print cards with your own layout? Regardless of what you require, we at YouCard feel confident to be your specialist contact person when it comes to plastic cards! 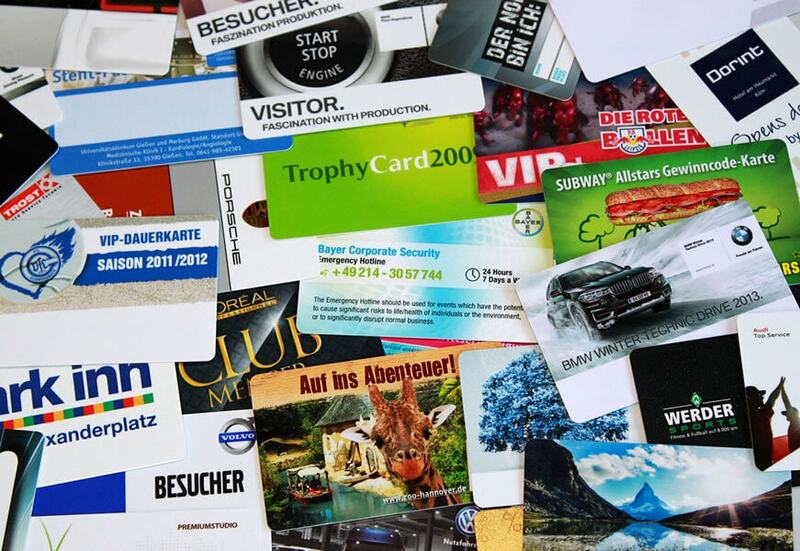 With our blank plastic cards, chip cards, RFID cards, smart cards or magnetic stripe cards with customized print and encoding, you always get premium products. Furthermore we support you from the beginning of your card project and will ensure that your cards will perfectly suit to your requirements. We promise: We will always provide you with the most suitable card option. YouCard card systems offers a extensive range of plastic cards in a variety of colors, different materials and various sizes. You can directly order each of the numerous card variations either as a set of blank cards or personalized and/or encoded from our card experts. Our premium printing systems guarantee an impressive print quality. And if you like to order at least 100 printed plastic cards, we advise you to our first class printing service, which provides you the posiblity to get own offset printed plastic cards, the best available card print! In case you attach importance to a maximum flexibility in terms of printing plastic cards and, for instance, would rather prefer to print your cards at your home or your company, we recommend purchasing a card printer. Owning a desktop card printer enables you to conveniently design and print your own plastic cards at any time. The usage of special cards like chip cards, smart cards or magnetic stripe cards is possible as well. Due to to our long experience with offical partnerships with leading manufacturers like HID Global, LEGIC, CardPresso or NXP (MIFARE), we are able to offer you chip cards high quality technical know how and excellent support. We also provide you with card software that allows you to easily create your own card layouts and card readers to transform your plastic cards solution in to a flexible and memory based ID management solution.